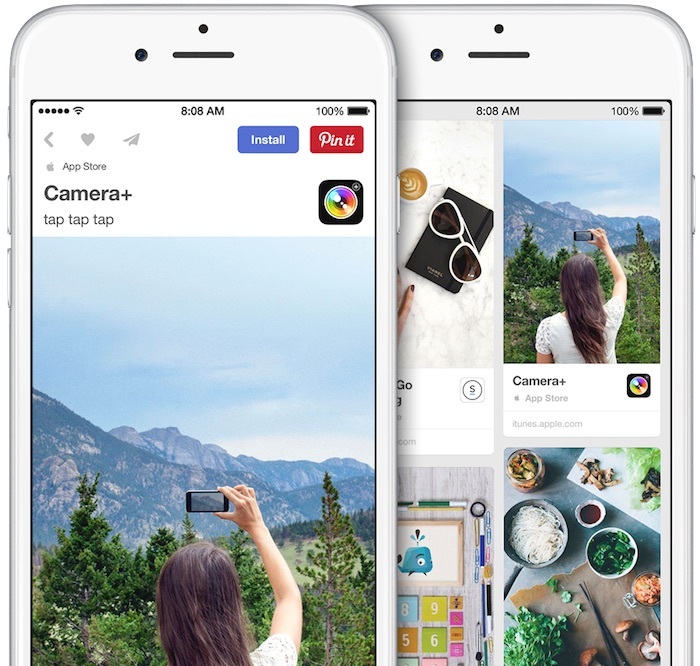 Pinterest today announced a new partnership with Apple to launch "App Pins" that will allow users to install iOS apps on their devices without ever needing to leave the Pinterest app. As part of the rollout, Apple is also launching its own App Store board on Pinterest, giving the company a place to feature apps on a variety of topics within Pinterest. Apple is currently featuring a number of apps and other pins focused on fashion and recipes, playing into this week's New York Fashion Week. Pinterest tells The New York Times it believes it can be an excellent place for app discovery considering its role as a place where people come to share and discover things. Pinterest believes it is better positioned [than Twitter and Facebook] to help promote apps because of the nature of the service. People come to Pinterest, the company says, to find new things to do, see and buy. That is unlike Facebook, which has been used to connect with friends, or even Twitter, which is often about public discourse and news. You've never been fewer taps away from degrading the quality of an image with some over-filtering! Next time, actually have a clue what the service does before you bash it. WTF - going to Pinterest to install apps. So is apple going to allow this for all social sites at some point? I really do question Apple's thinking here. Isn't this against App Store policy to install apps outside of the App Store? Apps to shovel apps to people? Really? Wasn't Apple previously against 'app discovery' apps - admittedly most of which would tell you what apps went free / on sale / discounted? Sales for apps made for middle aged mums will skyrocket! Oooh! I've never had a desire to use Pinterest, but now I want to so I can use it like an app blog. Is it really the same as side loading apps? It sounds like you are still downloading apps from the app store, meaning you can't create your own app, host it outside the app store, and get users to download it directly from Pinterest. It just seems like Pinterest has somehow found a way to mask the whole "get launched into the app store to download the app" process and make it all just happen in the background seamlessly. But otherwise, iOS apps linked there are still subject to app store rules, and Apple still gets their 30% cut. But Apple didn't allow Marco Armemt to do this. In the settings menu of his podcast app he has a list of competing apps. When you tapped on one it took you out of his app to the App Store. Apple forced him to remove it. Does he get to bring that back or is that functionally reserved for big name developers that partner with or pay Apple a lot of money?